PaleoGIS Now Supports FROGTECH Plate Model – The Rothwell Group, L.P.
We are pleased to announce that FROGTECH has joined The Rothwell Group’s family of plate model vendor partners. 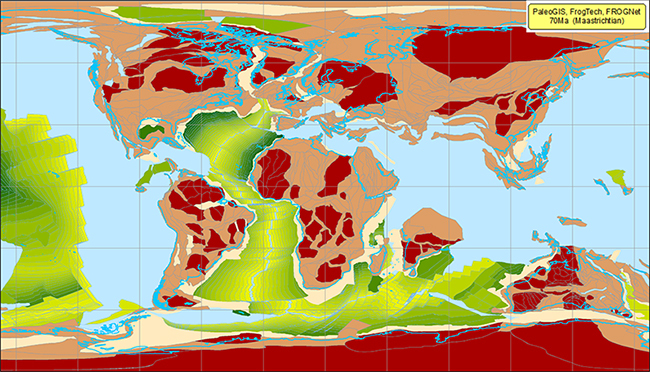 The company’s rigid plate model, FROGNet, is now fully supported by PaleoGIS. FROGTECH will demonstrate and review the geological development of the plate model at the 2014 PaleoGIS & PaleoClimate User Conference on November 5 in Houston, Texas. FROGTECH is a world leader in geophysical processing, structural and tectonic interpretations, basin analysis and resource-related geological science. The FROGNet Rigid Plate Reconstruction Model offers the insight into over 15 years of global mapping of tectonostratigraphic provinces and basement terranes. The partnership with FROGTECH is directly in line with Rothwell’s strategy of being the industry standard plate tectonics reconstruction modeling platform. PaleoGIS supports the leading commercial and academic plate models available on the market today. Many of these partners rely on PaleoGIS to develop their proprietary content. The Rothwell Group is a software engineering and process optimization company. For the petrochemical and mineral industries, the company has developed PaleoGIS, plate tectonics reconstruction software, and PaleoClimate, quick-cycle climate modeling software. These are screening tools that enable geologists and GIS professionals to predict high potential analogues with lower risk and cost, as well as understand basin and play formation with greater accuracy. The products are installed at the majority of the largest and fastest growing global oil and gas and mineral exploration companies. Season’s greetings and happy new year! Are your Excel spreadsheets making you crazy? Click here to learn more about Rothwell’s plate tectonics reconstruction and climate modeling tools, at PaleoGIS.com.